In case you're wondering, I'm sitting in Noel Sharkey's study (shivering slightly - it was a bitterly cold day in Sheffield). 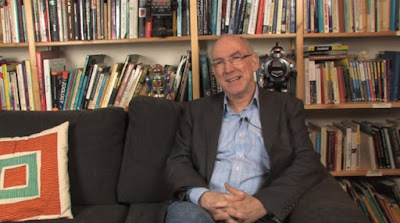 It was a real privilege to be asked to contribute, especially alongside the properly famous roboticists Peter interviewed. Do check them out. There doesn't seem to be an index page, but the set starts on page 2 of the IEEE.tv history channel. 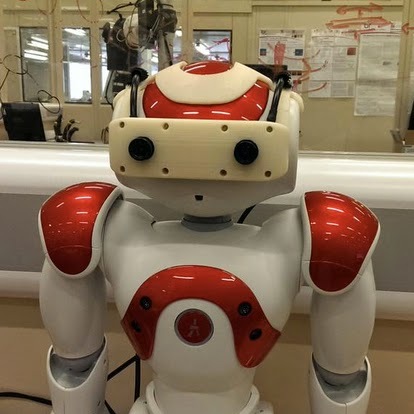 This post is just a quick update on our ethical robots research. 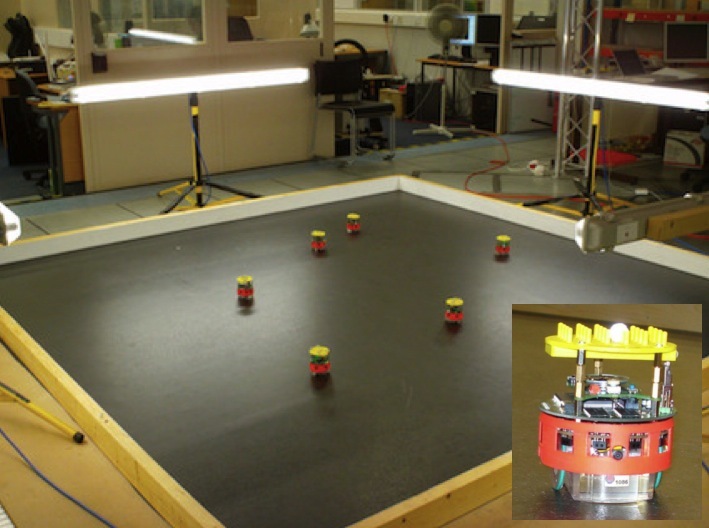 Our initial ethical robot experiments were done with e-puck robots. Great robots but not ideal for what is essentially human-robot interaction (HRI) research. Thus we've switched to NAO robots and have spent the last few months re-coding for the NAOs. 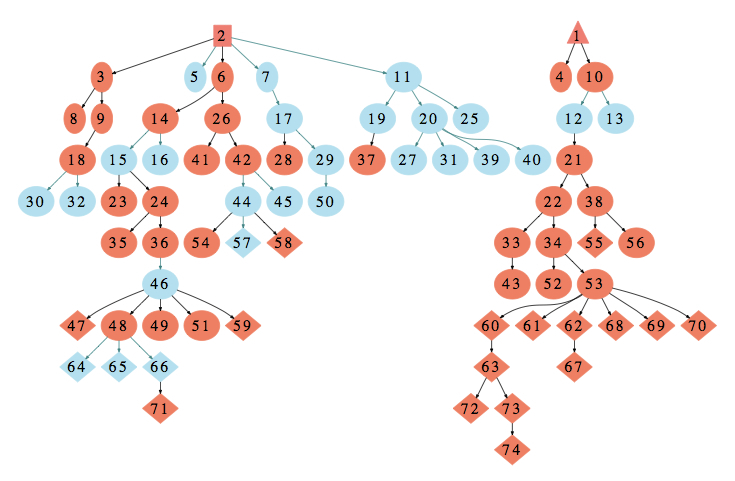 This is not a trivial exercise. 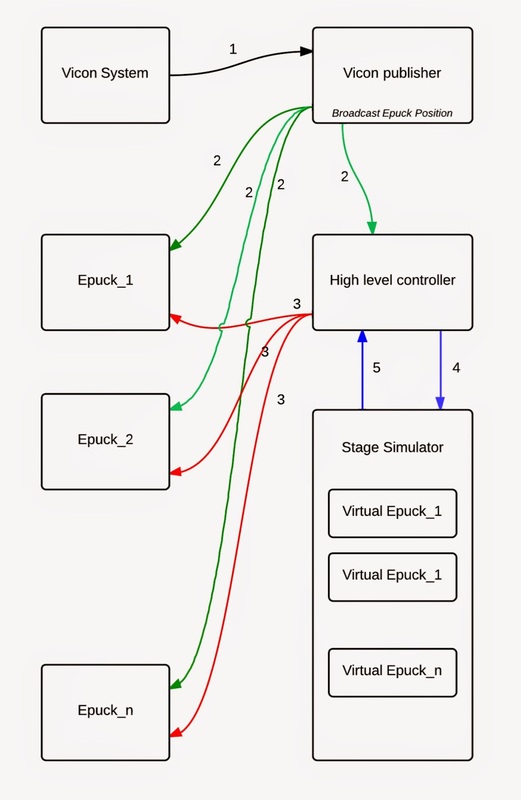 The e-pucks and NAO robots have almost nothing in common, and colleague and project post-doc Dieter Vanderelst has re-created the whole consequence engine architecture from the ground up, together with the tools for running experiments and collecting data. 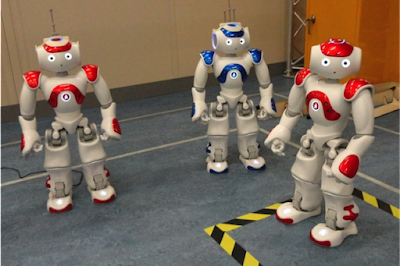 Why the NAO robots? Well, they are humanoid and therefore better fitted for HRI research. But more importantly they're much more complex and expressive than the e-puck robots, and provide huge scope for interesting behaviours and responses, such as speech or gesture. But we are not yet making use of that additional expressiveness. In initial trials Dieter has coded the ethical robot to physically intervene, i.e. block the path of the 'human' it order to prevent it from coming to harm. Here below are two example runs, illustrated with composite images showing overlaid successive screen grabs from the overhead camera. 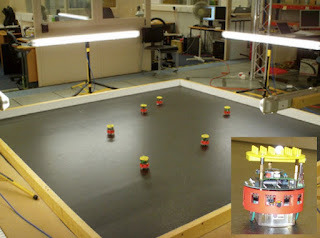 Here red is the ethical robot, which is initially heading toward its goal position toward the top right of the arena. Meanwhile blue - the proxy human - is not looking where it's going and heading for danger, at the bottom right of the arena. When it notices this red then diverts from its path, blocks blue, which then simply halts. Red's consequence engine now predicts no danger to blue and so red resumes progress toward its goal. Although we have no videos just yet you can catch a few seconds of Dieter and the robots at 2:20 on this excellent video made by Maggie Philbin and Teentech for the launch of the BBC Micro:bit earlier this month. Last week I found a couple of copyright violations. Am I upset? Not at all - actually I'm delighted that stuff I did in 1983 is alive and well on the Interweb thanks to the efforts of others. The first is an online readable copy of my 1983 book The Complete Forth. It's a textbook on the programming language Forth that I was heavily into at the time. The book was first published by Sigma Press, then internationally by John Wiley, and was translated into both Dutch and Japanese. Someone - I assume from the Jupiter Ace archive - has gone to the trouble of scanning every page. Even the pull out reference card. Whoever you are, thank you. 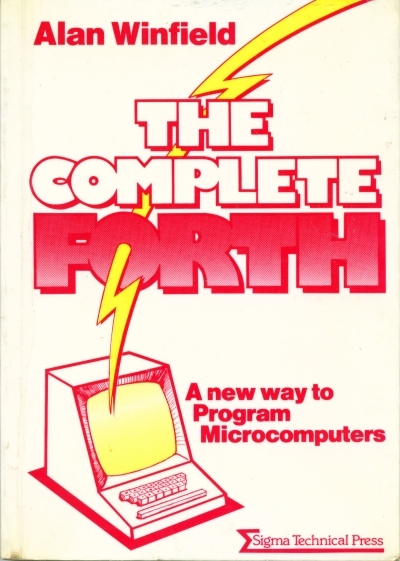 Just before I wrote that book, I had developed a Forth programming system (a programming environment that integrates compiler and interpreter) for the NASCOM 2 Z80 micro computer. Myself and a friend then marketed Hull-Forth and, I recall, sold several hundred copies. Of course this was pre-internet so marketing meant small ads in the magazine Personal Computer World. What we actually shipped was a printed manual together with the code on a cassette tape. Floppy disks were hugely expensive and beyond the reach of hobby computers, so for saving and loading programs we used audio cassette recorders. They were slow and very unreliable; if there was a checksum error you just had to rewind, cross your fingers and try again. I can't imagine anyone feeling nostalgic for that particular technology. Hah! Someone must have gone to alot of trouble to get the code from the original cassette*, recorded using the Kansas City Standard at, I think, 300 baud (so slow you could almost hear the noughts and ones! ), to a .NAS file you can download into your NASCOM emulator. Ok, now to get that NASCOM emulator running. It will be fun (and slightly absurd) to run Hull Forth again for the first time in about 33 years. *I probably still have one of those cassettes in my loft**, but no way of reading the data from it. **Along with stacks of punched cards, rolls of paper tape, and all kinds floppy disks. Imagine this situation. A large company decides to significantly increase the level of automation at one of its facilities. A facility that currently employs a substantial number of men and women doing relatively low-skill tasks, which can now be done by a new generation of robots. Most of the workers get laid off which, for them and their families, leads to real hardship. The company was the only large employer in the area, which is economically depressed (one of the reasons perhaps that the company built the facility there in the first place), so finding alternative work is really difficult. And because most of those jobs were minimum wage, with little or no job security, redundancy payouts are small or non-existent and this of course means that the laid-off workers have no financial buffer to help them re-skill or relocate. Now I am not anti-automation. Absolutely not. But I believe very strongly that the benefits of robotics and automation should be shared by all. And not just the shareholders of a relatively small number of very large companies. After all, the technology that such companies benefit from was developed by publicly funded research in university research labs. In other words research that you and I funded through our taxes. Ok, you might say, but companies pay tax too, aren't those taxes also contributing to that research? Yes, that's true. But large companies are very good at reducing their tax bill, multinationals especially. Our imaginary company may, in reality, pay most of its tax in a different country entirely from the one hosting the facility. And of course it is we, through local and national taxation, who - as best we can - pick up the pieces to support the laid off workers and their families, through family tax credits, employment and support allowance, and so on. Maybe we need an Automation Tax? If the new robotics and automation causes no-one to be laid off, then no tax is due. If the automation does result in jobs becoming redundant, but the company re-trains and re-deploys those workers within its organisation, then no tax is due. If the company does lay off workers but makes a tax-free redundancy payment to those workers - regardless of their contract status - sufficient to cover the full costs of retraining, upskilling, and - with all reasonable efforts - finding work elsewhere, then no tax is due. Only if none of these conditions are met, would the automation tax be due. The idea is not to discourage automation, but to encourage companies to accept a high degree of responsibility to workers laid off as a result of automation, and more widely their social responsibility to the communities in which they are located. The tax would enforce the social contract between companies and society. Of course this automation tax doesn't go anywhere near far enough. I think the best way of sharing the wealth created by robotics and automation is through a universal Basic Income, but until that utopian condition can be reached, perhaps an automation tax is a start.